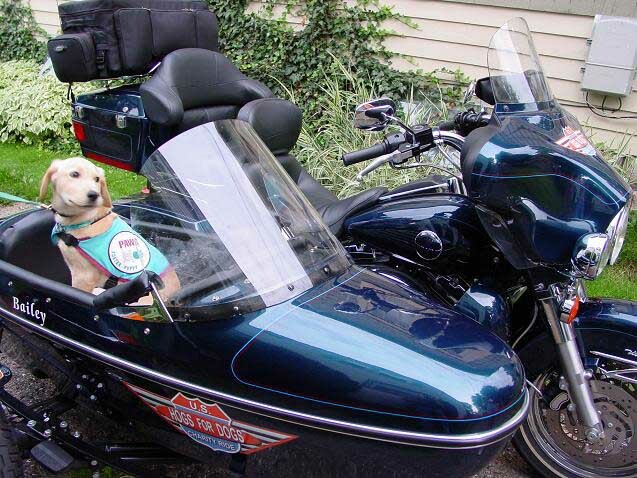 "Hogs for Dogs - Sidecar Page"
They say that every dog has his day. 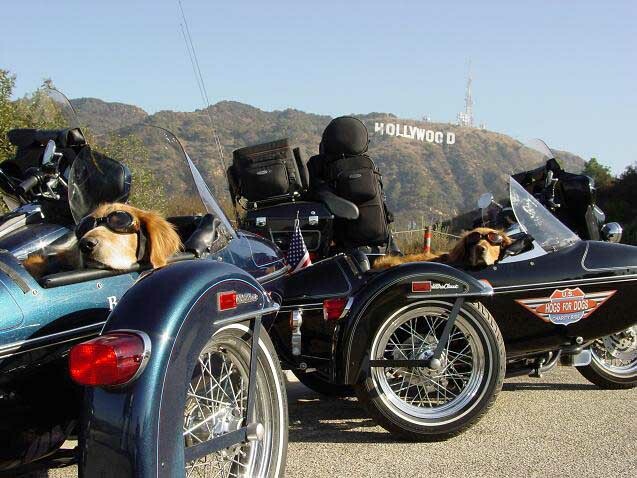 Max and I have been having ours for the last few months as we've traveled across the country for charity. Television personalities have sought out our story. Newspapers have printed pages and pages about our unique way of educating Americans about people living with disabilities and how Assistance or Guide Dogs can improve their independence. We've put smiles on thousands of faces as we've wound our way from state to state and our pictures have shown up around the country. Yes, folks, we're definitely having our day. But if history is any guide, our days are numbered. It occurred to me while we were in Los Angeles that even the most famous of dogs had to be concerned about the younger pups upstaging them. Old Yeller was pushed aside by sweet, lovable Lassie. Lassie ruled the roost for years until that wired-haired Benji moved into the limelight. Then Benji was nudged aside by a big, slobbery Saint Bernard named Beethoven. And Beethoven finally lost out to Air Bud. Now, Max and I are looking at our own demise. But not by one dog, there's an entire litter of cute lovable puppies trying to push us aside. We call them The Dirty Dozen. These career-threatening pups were all born from the same litter on April 12th, 2004. 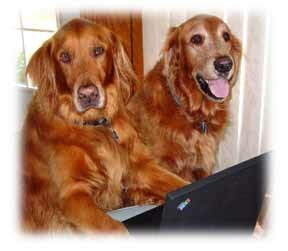 Their mom is a lovely Golden Retriever named Maggie and their dad is a good-looking yellow Labrador Retriever who calls himself Laker. So, you can imagine how they'd turn out to be all cute and cuddly. They even have that new puppy smell. How can we compete with that? This is serious! To make matters worse, these pups aren't just normal dogs. No, they have super canine qualities and have been identified as future Assistance Dogs for our majority charity partner, Paws With A Cause®. 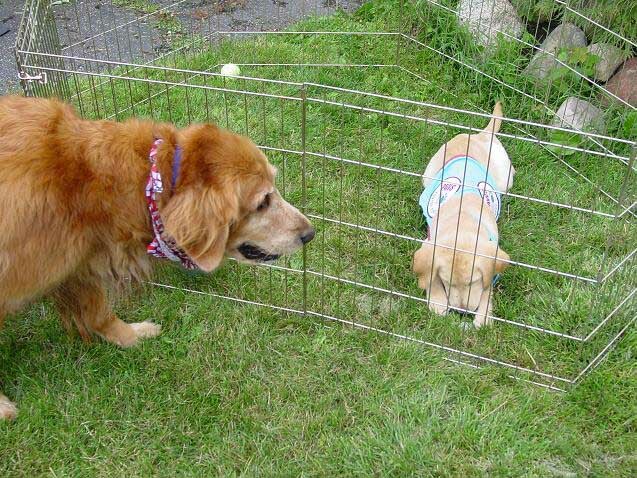 They probably have x-ray vision, can read other dogs minds and the ability to become invisible, or something like that. Good looks? New puppy smell? Super canine qualities? But just when I was ready to hate those little fur balls, I met Harley - one of The Dirty Dozen. He was cute, funny and had this little wobble of a walk that really cracked me up. He'd run up to a tennis ball in the grass, leap into the air and miss it completely as he rolled end over end before coming to a stop. Then, he'd sit up, shake his head and give the crowd a sheepish grin that said, "Wanna see me do it again?" before he'd get back up and try one more time. Finally, when I couldn't take it any longer, I pulled him aside for a little coaching on this whole tennis ball thing. It turns out that he's a great little guy who's just trying to make his way in this dog-eat-dog world. I called Max over and we played ball for a while and then listened to stories about all of Harley's brothers and sisters. They all sounded pretty likable when you heard it from Harley's point of view. But there was still this issue of them pushing us out of the limelight. Over the next few days, Max and I met several of The Dirty Dozen. Like Harley, they were all cute and charming as they wobbled around trying to figure out how to get all four legs to move in the same direction while their tails wagged from side to side trying to knock them off balance. One of the little tykes must have thought that his tail was the reason he was having so much trouble because he started chasing it in circles until he finally caught it between his teeth. Of course, then he was stuck walking in circles with his tail in his mouth. I'm not sure that was much better than his earlier stumbling, but he thought so. Max and I were really struggling with our conscience. The Dirty Dozen seemed nice enough, but a threat is a threat. We had to take these pups out before they grew up and took away our fifteen minutes of fame. Max suggested we push one of the tennis balls near the storm drain and see how many we could get to chase the ball - knowing they'd miss it completely and fall into the drain because we'd already seen Harley's preview. I wanted them out of the way, but wasn't so sure about such drastic measures. We are, after all, generally non-violent dogs. There had to be another way. And I was thinking on that subject when Chopper, another of The Dirty Dozen, came over to say hello. I looked down at him, wondering if I could squish him with my paw. So, you can imagine how stupid I felt when he looked up at me with those cute brown eyes and told me that I was his hero. 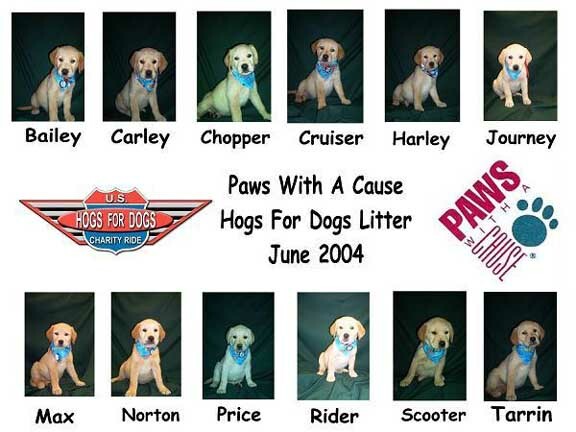 It turns out that The Dirty Dozen are named after our 2004 Ride Across America in honor of Max and me. It was Paws With A Cause's way of thanking us for our commitment to helping people with disabilities. Suddenly, instead of wanting to squish Chopper with my paw, I scooped him up and squeezed him like a proud parent. I realized that I might be squeezing him a little too tight when his cold little nose started to turn blue. That's not a good sign for a puppy. But not to worry, a little smack on the back and he was as good as new. So now, as Max and I are heading towards the east coast again, we realized something that Old Yeller, Lassie, Benji and all the other famous dogs that have come before us have probably learned themselves. It's true that every dog has his or her day. But if you're lucky, your day never really ends. It becomes a legend living inside the hearts of younger dogs like these twelve little heroes that will go on to help people living with disabilities achieve a more independent life. Our legend will live on through The Dirty Dozen and thousands of other dogs across the country if people hear our message and reach out to help us make the long waits for Assistance Dogs a thing of the past. 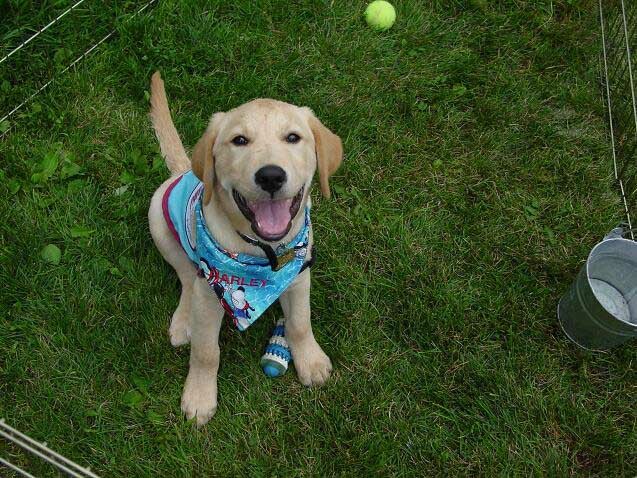 Each Assistance Dog costs approximately $18,000. That means that if The Dirty Dozen are to succeed, we need to raise over $200,000. That's a lot of money. But then, legends don't always come cheaply. Take just a moment to look into the eyes of The Dirty Dozen and learn their names. If you see the same future heroes that Max and I do, please make a donation or lend a paw to keep our legend alive. SIDECAR #01 October 2003 - Max and Bailey figure somethings up!